Get the series! Blood and Magic, Blood and Sorcery, and Blood and Illusion. Listen to Hollie Jackson read a snippet right here. 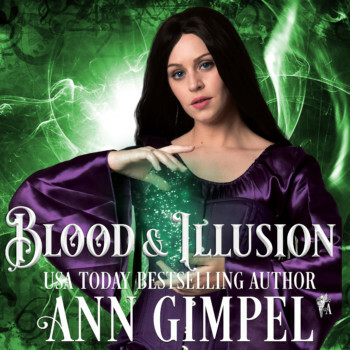 Blood and Illusion: Not all witches join the Coven. Fiercely independent, Isla heads up her own small band in the San Francisco area. She’s never needed help before, but dark sorcerers drive her and her group into hiding, trapping them. Sam’s worked for the Coven as one of their enforcers forever. He’s been there so long, the Coven is the only mistress he knows. It’s a lonely life on the road thwarting wickedness and Black Magick with his guns, his magic, and his horse. But it’s been enough to satisfy him. Until now. A group of witches is in deep trouble. They’re not part of the Coven, but Sam is sworn to protect all witches and he rides to their assistance with several of his brothers. Nothing prepares him for the outspoken spitfire who ends up riding double with him. She’s forthright, opinionated, and downright hostile, but he’s drawn to her self-sufficiency—and her undeniable beauty. Pretty soon, Isla is all he can think about.